Heavy-duty van storage, made easy. 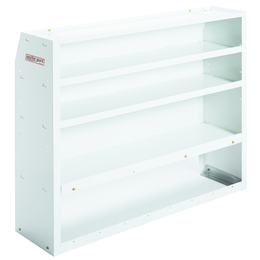 WEATHER GUARD® EZ-Cube Shelving is pre-assembled and ready to install. 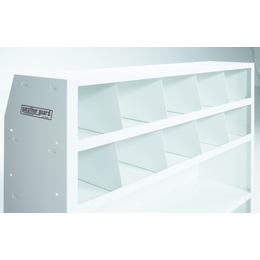 Pre-punched shelves allow for quick installation of cabinets, bin dividers, or accessory doors. 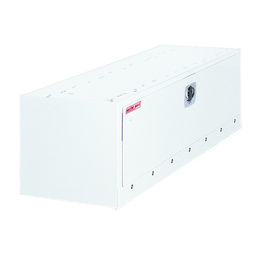 Heavy-gauge steel construction with our signature bright white powder coat ensure years of durability, and a professional appearance. 9400-3-01 4 43¾" 42" 11¾ 13¾ 76 lbs. 9452-3-01 4 43¾" 51" 11¾ 13¾ 90 lbs. 8401-3-01 EZ Bin Dividers (8) 18 lbs. 8841 EZ Shelf Mat (trim to fit) 1 lbs. Designed to mount to the floor or on top of the Wheel Well Base Cabinet. Dividers are welded in place. 8230-3-01 3 30" 36" 12" 6 25 lbs. 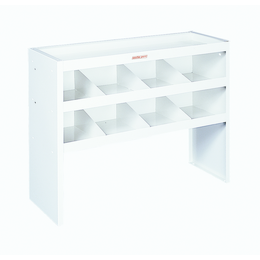 Designed to fit over the wheel well and provide a flat, sturdy foundation for Shelf Units, Parts Cabinets, or Drawer Units. 9444-3-01 13¾" 42¾" 15" 49 lbs.